36/60 Les Winan Jeff Daniels is outstanding, but the movie never quite takes off. Certainly interesting in a depressing, sad sort of way. 58/85 Kim Hollis I wanted to like it a lot more than I did. 127/166 David Mumpower If this is what Noah Baumbach's childhood was like, I'm glad I didn't know him. Has the most disgusting subplot of 2005. A film that gained some decent buzz at Sundance, The Squid and the Whale is from writer/director Noah Baumbach, whose most recent collaboration was with Wes Anderson on the screenplay for The Life Aquatic With Steve Zissou. The film won both the director's and the screenwriter's award at Sundance, as well as being nominated for the Grand Jury Prize. 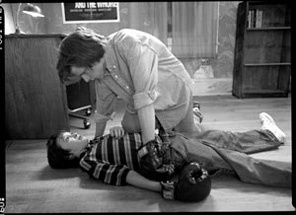 The story is based on the true childhood experiences of Baumbach and his brother. Bernard Berkman (Jeff Daniels), the father of the eccentric Brooklyn family, claims that he was once a famous novelist, but he has now settled into a teaching job instead. His wife, Joan (Laura Linney), discovers that she has writing talent of her own, which causes jealousy to drive wedges between the various family members. The parents split up, and the two teenage Berkmans, Walt and Frank, are forced to forge new relationships with them. As the kids try to deal with their parents' divorce, Joan begins an affair with her younger son's tennis coach. Making matters even worse, Bernard starts sleeping with one of his students - one whom his older son just happens to be romantically pursuing.